When the Spanish cook octopus they like to ‘scare’ it first by dunking it in and out of boiling water a couple of times before the final plunge…this being an Italian dish we decided to refrain from terrorising our poor dead eight-legged cephalopodic friend and just plop it straight in the pot. In a large saucepan bring enough water to cover the octopus to the boil, season with salt and pepper and pour in a generous glass of wine. Drop in the octopus and boil for 10 minutes. Remove from the water and set aside to cool – don’t throw away the water, you’ll be using it to cook the potatoes in a minute. 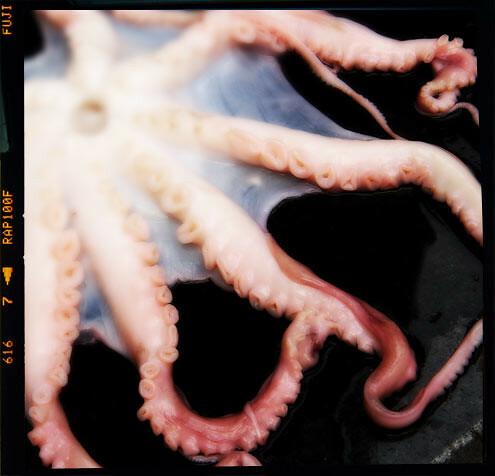 When the octopus is cool enough to handle, cut into bite-size pieces. Heat some olive oil in a large deep frying pan and add the onion, garlic and chilli. Cook until softened but not coloured. Add the octopus, tomatoes, capers, anchovies, olives, bay leaves, fish stock, parsley, a splash of white wine and a drizzle of olive oil. Simmer gently for 35–45 minutes. Meanwhile cook the potatoes in the octopus/wine stock for about 10 minutes or until just tender. When cooked add to the octopus stew and stir everything together. Verdict: A rich, comforting, tasty dish which makes a great Saturday night treat. Entertainment: ‘Troll Hunter’ on DVD. Zzzzzzz.